Recently I borrowed an impressive large-format book written by Dr. J.A. Fowlie on the bifoliate cattleyas of Brazil and published in 1977. 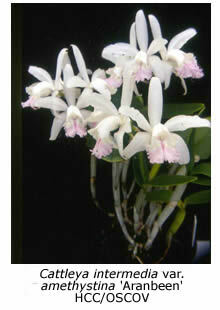 It contains many striking illustrations and detailed descriptions of the various cattleya species. More importantly for those who wish to grow these species to their full potential are detailed descriptions of the habitats where they are found. Bifoliate cattleyas are those, of course, that bear two leaves on each pseudobulb. In general they carry smaller flowers (but more of them) than the monofoliate cattleyas and can withstand slightly cooler conditions. I grow a few bifoliate cattleya species in my heated glasshouse (minimum temperature 12°C) and have tried several in an unheated ‘cosy’ shade house. All do slightly better with winter warmth but I have successfully grown and flowered the alba variety of Cattleya intermedia outdoors over a period of several years; surprisingly, the normal pink-flowered form resented its removal from the glasshouse. 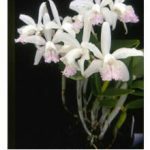 Cattleya intermedia is native to southern Brazil, Paraguay and Uruguay at latitudes that correspond roughly to those of Rockhampton in the north to Coff’s Harbour in the south, which gives one some idea of the likely climate. Fowlie states that C. intermedia is found along a 700 mile stretch of coastline, although it is more common in the north, near Rio de Janeiro. A Mr. J.J. Keevil found it growing on the small island of Santo Amaro, a short distance south of Rio in 1909 and wrote the following description of its habitat. He wrote “on the south and east it faces the Atlantic, with hilly islets, lovely sandy bays and coves, interspersed with steep granite headlands. On the west and north it is separated from Santos Island and the mainland by narrow sea channels. It (Santo Amaro) is eighteen miles long by six broad. Note the relatively high humidity, which probably explains why we seldom see plants grown to perfection here. Such humidity levels are difficult to maintain in an enclosed glass house, and impossible under shade-house conditions during a typical summer in Melbourne. Other orchids found growing in the vicinity of Cattleya intermedia in nature include Cattleya leopoldii, Oncidium flexuosum, Promenaea sp., Gongora sp. and numerous pleurothallids and maxillarias. Fowlie’s book contains other habitat information for C. intermedia and the many other bifoliate cattleyas native to Brazil, and I highly recommended this attractive volume to all growers of species cattleyas.